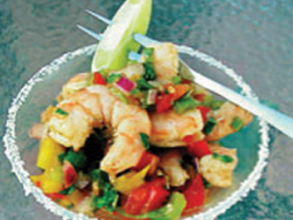 Think Seafood Lover’s Delight! 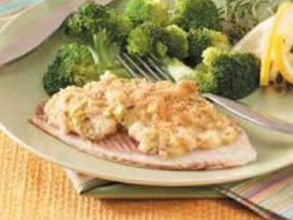 Flaky tilapia fillets are topped with a delicious crab stuffing that is sure to please all you fishy foodies! Preheat oven to 350 °F. Spray a 9-by13-inch baking pan with vegetable cooking spray. Heat oil in a medium skillet over medium heat. Add shallots and cook, stirring frequently, until they begin to soften, about 5 minutes. Add garlic, pepper, salt and paprika. Stir until evenly blended and remove from heat. In a large bowl, whisk together egg, mayonnaise, lemon juice, Worcestershire sauce and mustard. Add cracker crumbs, crabmeat and shallot mixture. Stir gently until evenly blended. 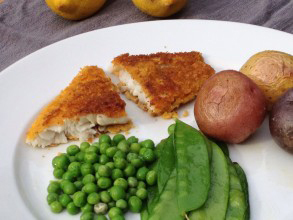 Arrange tilapia in prepared pan in an even layer. Spread crab mixture evenly over the top. Bake until tilapia is cooked through and crab topping is golden, about 22 to 25 minutes. Cool for 5 minutes, then transfer to serving platter. 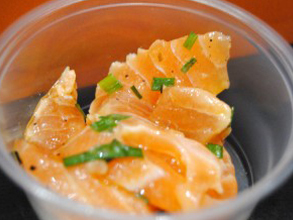 Garnish with parsley and lemon wedges. Source: Hannaford Fresh Magazine, March – April 2012.